From their start -- the 1851 "Great Exhibition of the Works of Industry of all Nations" at the Crystal Palace in London -- world's fairs were places where manufacturers labored to dazzle visitors with technological ingenuity and, not by the way, to encourage them to buy products. 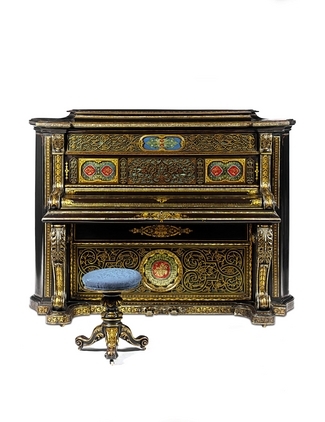 The fairs also made their mark in a less well-known way: as incubators for advances in the decorative arts. "Inventing the Modern World: Decorative Arts at the World's Fairs, 1851-1939" explores that influence by showcasing nearly 200 objects drawn from every major fair in that period and many minor ones. The exhibition, which opened on April 14 and runs until Aug. 19 at the Nelson-Atkins Museum of Art in Kansas City, Mo., borrows from 45 museums and private collections in nine countries, and includes furniture, jewelry, glass, textiles, ceramics and metal-works. "These objects were modern marvels of their period," says co-curator Jason T. Busch of the Carnegie Museum of Art in Pittsburgh, where this touring show opens next fall. Some items would fit right into a home today, like a swervy rocking chair made of tubular iron and attributed to the W.R. Winfield firm in Birmingham, England. "It's a markedly modern design, with the curves of Rococo Revival but ergonomically designed for the body in a way we're still borrowing from," says Mr. Busch. In the 19th century, aluminum, now common, "had the status of silver," Mr. Busch says. It was used to make a Moorish-style papier-mâché piano (at right) that was fashioned by John Bettridge and Co., also of Birmingham. Considered to be the largest example of papier-mâché furniture from a world's fair known to exist, it was acquired by the Carnegie Museum from a private U.S. collection for the exhibition. Catherine L. Futter, the Nelson-Atkins curator who began researching this subject 15 years ago, notes how one Japanese vase, pictured above left, reflects the cross-cultural benefits from the fairs. 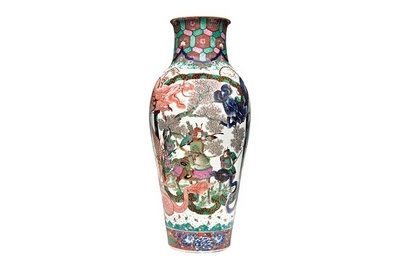 Shown at the 1876 Philadelphia Centennial International Exhibition, the vase depicts samurai fighting amid blossoming cherry trees in an asymmetrical European style. "It's the Japanese looking at Europeans looking at Japanese art," Ms. Futter says. Further, the vase is made with purples, yellows and other hues to which the Japanese did not have access until a German chemist named Gottfried Wagener, working for a trading firm in Nagasaki, brought them to Japan. The curators designed the exhibition to give a sense of what attending these fairs was like. "I know they have been tracking down things from all over the world, always looking for the best things," says Nonie Gadsden, senior curator in American decorative arts at the Museum of Fine Arts in Boston. Many items have never been seen in the U.S., and some haven't been shown publicly since before World War II – until now.